Bedouins in the Sinai desert, Photo Shutterstock. Egypt shares long borders with Libya to the west and with Sudan to the south. To the north lies the Mediterranean, on whose coast lies Alexandria, Egypt’s second largest city. To the east lies the Gulf of Suez, which is connected to the Mediterranean Sea by the Suez Canal. East of the canal lies the Sinai Peninsula, a vast territory of desert and mountains that connects Africa to the Asian continent. The Sinai’s eastern border stretches from the Gaza Strip on the north to the Israeli city of Eilat, at the head of the Gulf of Aqaba. 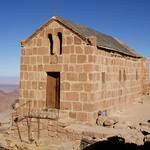 At the southern centre of the Sinai lies the highest point of Egypt, Mount Catherine, at 2,642 metres, near the famous Saint Catherine Monastery and Mount Sinai (Mount Moses/Jabal Musa). The Nile River has always been the determining socio-geographical feature of Egypt. Civilization flourished along the fertile banks of the longest river of Africa, enjoying the protection of a vast desert to the west and that of desert and mountains to the east. The current capital, Cairo, is located just south of where the river separates into the waterways of its delta, on the northern (Mediterranean) coast. This location coincides roughly with what has historically been seen as the transition between Upper (southern) Egypt and Lower (northern) Egypt. The vast desert west of the Nile extends into Libya. This area is sparsely populated; only a few oases provide the basic conditions for sustainable agriculture, namely Bahariya, Farafra, Dakhla, Kharga, and Siwa. In the far south, near the border with Sudan, lies Lake Nasser (6,000 square kilometres), the world’s largest artificial water reservoir, where Nile water is collected and regulated through the Aswan High Dam. 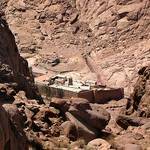 The dam has ended the yearly flooding of the lands along the river and provides Egypt with large quantities of hydropower. Upper Egypt, along the banks of the Nile, is mostly rural. Notable cities are Aswan, Luxor, Sohag, Asyut, Minya, and BeniSuef. South-west of the capital is a large concentration of population on the plain of the Faiyum. North of Cairo lies the densely populated and fertile Nile Delta, home to intensive agriculture and heavy industry. Noteworthy cities include Zagazig, Shibin al-Kawm, Tanta, Abu Kabir, Mansoura , al-Mahalla al-Kubra, Damanhur, and Kafr al-Sheikh. Egypt rightfully advertises itself to the world as ‘Land of the Sun’. On average, the temperature varies between 27 and 32 °C in the summer and up to 42 °C on the Red Sea coast. Winters are moderate, as temperatures vary between eight degrees and 21 °C. During the winter, the northern coast receives substantial rainfall, as much as 410 milimetres. 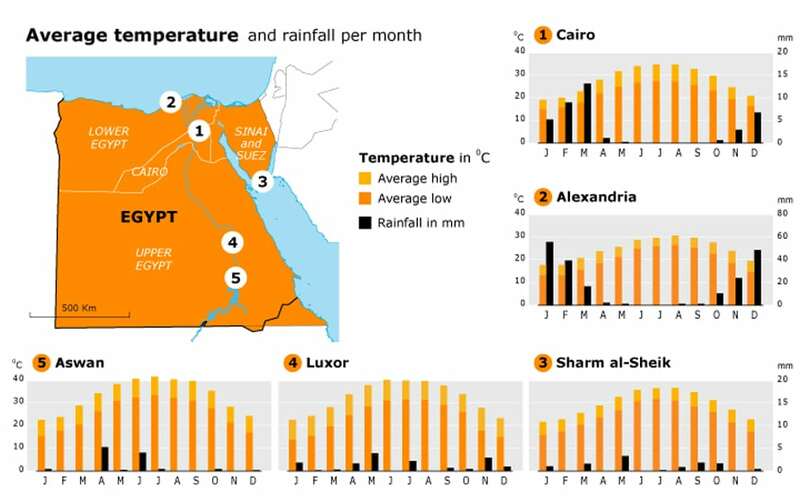 South of Cairo annual rainfall does not exceed five milimetres. During spring, usually in April, a strong wind blows dust and sand from the south accompanied by fluctuations in temperature over a period of some fifty days, hence the name of the wind, khamsin, the Arabic word for ‘fifty’. Situated between the Mediterranean Sea to the north and the Red Sea to the south, Sinai is located between the African and Asian continents. 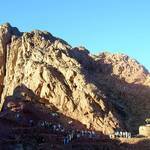 Because of its rich natural setting, its attractiveness for diving and surfing, and its biblical history – Mount Sinai is one of the most religiously significant places in the monotheistic faiths – Sinai is a popular vacation destination. Because of its strategic position, however, it has also been the scene of many wars. Sinai came under Egyptian control in 1906, when the Ottoman Empire formally transferred administration. The British, who had effectively been ruling Egypt since 1882, drew what is today the eastern border of Sinai, running from Rafah in the north to Taba in the south. In 1948, the Arab-Israeli War turned Sinai into a battlefield, where the conflict ended in settling the border roughly as it was under British control, with the exception of the Gaza Strip, which fell under the All-Palestine Administration. UN Emergency Force (UNEF) troops came to Sinai after the Tripartite Aggression by Israel, the United Kingdom, and France against Egypt. The Gaza Strip came under Egyptian control in 1958 and was governed as a separate entity, but the 1967 war between Egypt and Israel brought large parts of Sinai under Israeli control. As a consequence, many Egyptians were forced to flee the region, and Israel commenced settlement construction throughout the peninsula. Due to the subsequent War of Attrition that lasted until 1970, Sinai remained a very dangerous region, with combat on various scales. President Anwar Sadat tried multiple times to find a solution for Sinai, engaging in yet another war in 1973. It was not until the Camp David Accord was signed in 1979 that Sinai was gradually vacated by Israel; the Gaza Strip remained under Israeli control. Palestinian resistance to Israeli control has led to the building of an estimated 1,200 or more tunnels that run between Egypt and the Strip for the transfer of goods, from food, medicine, and books, to fuel, car parts, and weapons. Since the Second Palestinian Intifada (began in 2000), Sinai has been the scene of terrorist attacks by Islamist militants of either Egyptian or Palestinian nationality, or both. Attacks on tourist resorts took place in 2004, 2005, and 2006. The deadliest of these attacks was in Sharm al-Sheikh in 2005, when 88 people were killed. The most recent terrorist attack, in 2012, took place on the Egyptian-Israeli border, near the town of Rafah. Israeli and Egyptian intelligence were both aware of an impending attack. The Israelis took measures, but the Egyptians did not take the matter as seriously, perhaps because it was deemed impossible that such an attack could take place during the holy month of Ramadan. Nobody claimed the attack, in which sixteen Egyptian soldiers and an unknown number of perpetrators were killed. It is believed that it was executed by people belonging to a global terrorist network, assisted by the Sinai Bedouins. According to several newspapers in Egypt, three of the people deemed responsible for the attack were among the Islamist political prisoners recently released from jail by President Morsi. The government denies this. As a consequence of the event, President Morsi fired his intelligence chief, Murad Mowafi, the governor of Sinai, and the commander of the presidential guards. He appointed new chiefs of security and police and ordered the destruction of several the infamous Sinai tunnels that were used in this terrorist act. The attack came after a series of explosives attacks on the gas pipelines between Egypt and Israel that have been a source of discontent for many, not just for Islamist militants. The prevailing political opinion was that gas should not be provided to the State of Israel that oppresses the Palestinian people, but many also feel it should not be provided to Israel when there is a gas shortage in Egypt. 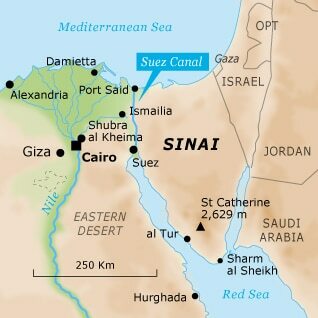 Sinai has also become a place for the human trafficking of refugees, mainly from South Sudan and Eritrea, to Israel and from there to the West. Some of these refugees have been attacked, kidnapped, tortured, or raped by bands of Bedouin criminals who try to make money from the misery of these displaced people. There are reports that some people have been killed in order to steal their organs. Although most of Egypt is arid, the country has a wide diversity of terrestrial habitats, due to the variety of ecological zones. There is a relatively small number of plants and animals, few of which are endemic. Many species have adapted to the desert and are therefore difficult to find. Biodiversity is under threat from human activity and encroachment. Environmental protection has long been neglected. Although laws are in place, they are often not enforced. The greatest long-term environmental issues facing Egypt are water pollution and limited freshwater resources. Egypt is categorized by the World Bank as being under ‘water stress’ and heading towards ‘water scarcity’. Despite this warning, much water is wasted. North (downstream) of the Aswan High Dam soil salination is increasing and affecting agricultural production; the transport of nutrient-rich sediment to the floodplain downstream of the dam is greatly reduced. Heavy use of fertilizers and pesticides is also polluting the soil. The Nile is polluted by agricultural drainage water, industrial waste, solid waste, and raw sewage. To make matters worse, the per capita consumption of water and electricity is increasing, while resources remain limited. 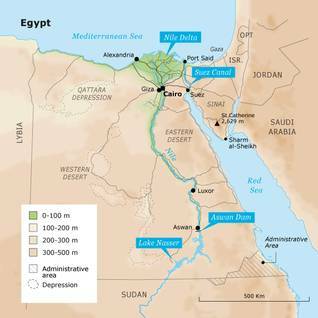 Egypt is finding it increasingly difficult to maintain the same rates of Nile water (55 billion cubic metres annually) coming from Ethiopia, as other Nile-basin countries have rebelled against the rates set back in the 1950s, when nearly all these nations were under foreign colonization. Agricultural land is being lost to human settlement and desertification.